Mother’s day is right around the corner and somehow with the lack of seasons in Bangkok it has crept up on me, just like all the other holidays since our move. I’m looking forward to a low key Mother’s Day with the hubby, Jellybean and the fur baby. If you are looking for a hilarious 1st Mother’s Day check this story out. As a child I remember heading to the book store early Mother’s Day morning with my father. We would walk around the store, pick out a book, a card and buy some flowers before heading home. It wasn’t until years later I found out my mother preferred my sister and my handmade gifts or really anything other than a book as a gift. Sorry Mom, I promise no book for you this year! Earring // Because let’s be honest a little bling bling never hurt anyone! Zella Headband // Super comfy headband and it goes perfectly with live in leggings! Mama Bear Sweatshirt // This was what Jellybean got me for my second mother’s day. Personalized Calendar // My go to give for my mom. She loves the personalize pictures and I enjoying picking out my ones favorites from the past year. Makeup Brush Holder // Classy, decorative and functional. Massage and/or a Mani & Pedi // Pampering and a little mommy alone time is good for the soul. Canvas Boat Bag // Us Mama’s are always toting around a bunch of stuff. 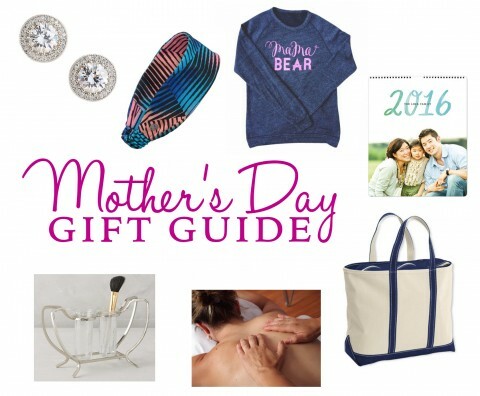 What are you go to Mother’s Day gifts?